Pursue your passion for education with Massey’s Bachelor of Arts (Education). Massey is in the world’s top 150 universities for education. The Massey BA (Education) delivers skills and strategies for learning, from the sociological to the philosophical. You’ll explore the developmental and cultural factors that influence approaches to learning, and gain transferable skills that will serve you personally and professionally. A BA (Education) will develop your ability to analyse, articulate and disseminate ideas that incorporate a range of viewpoints. You’ll engage with the research that examines how we learn, what we learn, and how we transform that learning into action. Please note that the Bachelor of Arts (Education) does not qualify you to be a teacher in New Zealand. If you want to be a teacher, you will also need to take a postgraduate teaching qualification. Please explore your options in our education pathways tool. I’ve always had a mind for being a teacher, so I wanted to choose an undergraduate degree that would allow me to learn as much as I could about children and education. Massey University’s Bachelor of Arts in Education gave me this knowledge and more. The course seemed really straightforward and provided great flexibility, which allowed me to explore other areas I am passionate about. I was able to take courses in Māori culture and language, and I look forward to sharing my knowledge of Te Reo with my own class one day. Studying the BA also opened up a range of other opportunities if I decide to delve into other areas of the education sector like special education, counselling and human development. My degree has taught me about inclusion and treating everyone equally, and that every child is different and has different learning styles. I’ve learnt to be open and supportive, to think about things from diverse perspectives, and to make any situation (good or bad) a positive one. 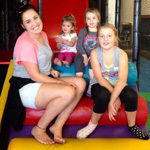 In my work as a nanny of six children ranging from two and a half years old to 19 years old I have been able to support the children’s learning developments using the skills I have gained. I’m constantly asking them open-ended questions to keep them thinking about what they’re learning and enhancing their communication abilities. This encourages them to think of things from a range of aspects and to continue discovering new information and new areas of their learning.